There are several state parks located through the Mat-Su Valley. The major parks in the Mat-Su are Denali State Park, Independence Mine State Historical Park and Nancy Lake State Park. Other minor parks include Big Lake (north and south), Finger Lake, Kepler-Bradley Lakes, King Mountain, Matanuska Glacier and Summit Lake. The name "Denali" comes from the tallest peak in North America (also known as Mt. McKinley). The park is about 130 miles north of Anchorage and offers outstanding views of Denali as do the trails to Kesugi Ridge. A southern viewpoint of the mountain along the highway is found at Mile 135.2 of the Parks Highway. At Byers Lake, located in Denali State Park, visitors can take advantage of kayak and canoe rentals on site or participate in guided kayak excursions provided by Denali Southside River Guides. Mountain Light Adventures also offers guided nature hikes in the park. Tent and car camping is available - this chart provides specific information about camping areas and the amenities offered. There are two public use cabins located on Byers Lake. The cabins are available for nightly rental year-round by pre-paid reservation through the Mat-Su Area Headquarters in Wasilla at 745-3975 or the Public Information Center in Anchorage at 269-8400. Online reservations can be made at www.dnr.state.ak.us/parks/cabins. While enjoying the Denali State Park area, stop by the Alaska Veterans&apos; Memorial to learn about the people of Alaska who served in United States military. Monuments for all five branches of the military are represented at the memorial. For a map and more information about Denali State Park click here. Independence Mine State Historical Park features the abandoned buildings and machinery of a 200 worker camp and hardrock gold mining operation that was one of Alaska&apos;s biggest gold producers in the 1930s. 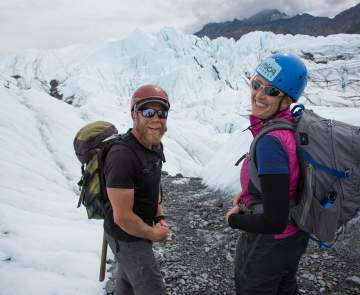 Located in the rugged Talkeetna Mountains, less than a two-hour drive from Anchorage, visitors can enjoy walking tours and cross country skiing through the historic mine operations. Group lead tours are also available. 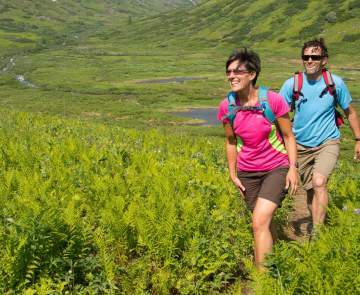 There are hundreds of miles of trails for hiking, skiing and snowmachining at Hatcher Pass plus white water rafting opportunities. Visitors can bring their own gold pan within the state park boundaries and try their luck at panning for gold. August and September brings a bountiful mix of wild Alaska blueberries and cranberries. Berry picking is permitted however plant removal is prohibited at this park. For a map and more information about Independence Mine State Historical Park click here. A 90-minute drive from Anchorage and just south of the community of Willow lies Nancy Lake State Park. This park differs from the rest of the state park system because of the flat terrain. This makes it ideal for a variety of recreational opportunities both in summer and winter. Its network of more than 130 lakes features camping areas, canoe rentals, hiking and skiing trails. The lake also offers those who like to fish for rainbow trout, arctic char and northern pike a chance to do so. Several public use cabins are also available for rent on a nightly basis. For a map and more information about Nancy Lake State Park click here. 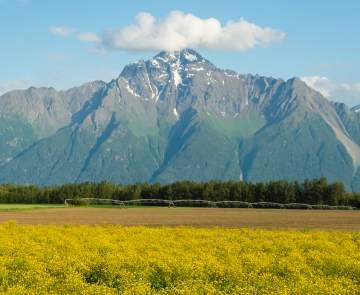 For more in depth information about specific state parks in the Mat-Su Valley click here. If you are interested in becoming a volunteer click here. Gateway to the Mat-Su Valley from Anchorage, this refuge has endless photography possibilities. Birders, wildflower lovers and outdoor enthusiasts flock to the area. Access hiking trails from Knik River exit (Reflections Lake) or Cottonwood Creek in Wasilla (Scout Ridge Trail).